Synopsis: Utter is a special Singapore Writers Festival initiative which showcases the best of Singapore writing and celebrates its potential to be adapted into different media and across languages, giving audiences fresh perspectives and a deeper understanding of our homegrown authors. In this year’s edition, the written word meets the creative and aesthetic sensibilities of established and emerging animation directors from Singapore. Targeting at literary and film aficionados, Utter 2015: Head Trips also aims to reach out to the general audience through animation’s unique accessibility, with the hope of encouraging greater appreciation for Singapore’s literature and animation. The showcase is presented by the National Arts Council and produced by The Filmic Eye. There will be a 30 – 45 minute post-screening dialogue with selected authors and animation directors after each 45 minute screening session. Ever read a piece of text and visualised it with pictures in your head? Six animation directors have come together to bring five very varied texts from page to screen, celebrating the endless possibilities of infusing writing and visual media. 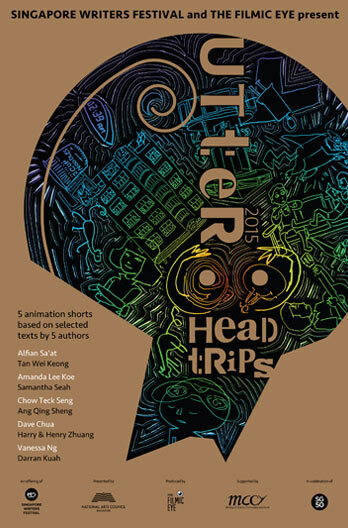 Aptly named Utter 2015: Head Trips, you may want to walk into this special Singapore Writers Festival initiative with zero expectations - so you can fully immerse yourself in an eye opening psychedelic journey. In ‘The Tiger of 142B’, directors Henry and Harry Zhuang adapt Dave Chua’s short story of the same name from the book ‘The Beating and Other Stories’, a man finds it increasingly difficult with his girlfriend. Things are made more intriguing with a roaming tiger in the vicinity. The 11 minute short explores the human psychic, and how human relationships are breaking apart. The exquisite animation has a somewhat exotically absorbing feel to it. Samantha Seah adapts Amanda Lee Koe’s three stories ‘FlamingoValley’, ‘Carousel’ and ‘The Ballad of Ariene & Nelly’ from the book ‘Ministry of Moral Panic’ into a surreal nine minute short titled ‘Round’. The analogy is well expressed in this piece about two girl’s love hate relationship. With the forlornness that lingers after the credits, there is also a whimsical feel that makes this artfully directed romance piece unique. The most accessible of the lot, Darran Kuah’s 10 miinute ‘The Fat Cat, Ate Dad’s Hat!’ chronicles the nine lives of a cat, and how its fate is determined by the circumstances around it. Adapted from Vanessa Ng’s short story of the same name from the book ‘From the Belly of the Cat’ edited by Stephanie Ye, the interesting narration script is brought to life by voice actors of different genders and ages. In Tan Wei Keong’s ‘The Great Escape’, viewers get to explore the intimate relationship between two men and their olive tree. The most experimental (read: artistically abstract) of the five shorts, this adaptation of Alfian Sa’at’s poem of the same name from the book ‘The Invisible Manuscript’ may not go down well with the masses, but be patient with the six minute work, and you’ll be rewarded with an affectionate tale of human connection. The only Chinese short ‘5 Shades of Solitude’ is a melancholic piece about a man’s experiences with depression, yearning, denial, divergence and boredom. Ang Qing Sheng visualises Chow Teck Seng’s poem ‘5 Colours of Melancholia and Silence’ from the book ‘The Story of You and Me’ with this nine minute short, and poignantly hits the gloomy nerves in viewers. The five shorts are nothing like your typical commercial animation, so watching them with an open mind would do you good. You may just be inspired to pen something, or take to animation to interpret your favourite with pictures. Imagination knows no boundaries, and this collection of short films is a fine testament to that.